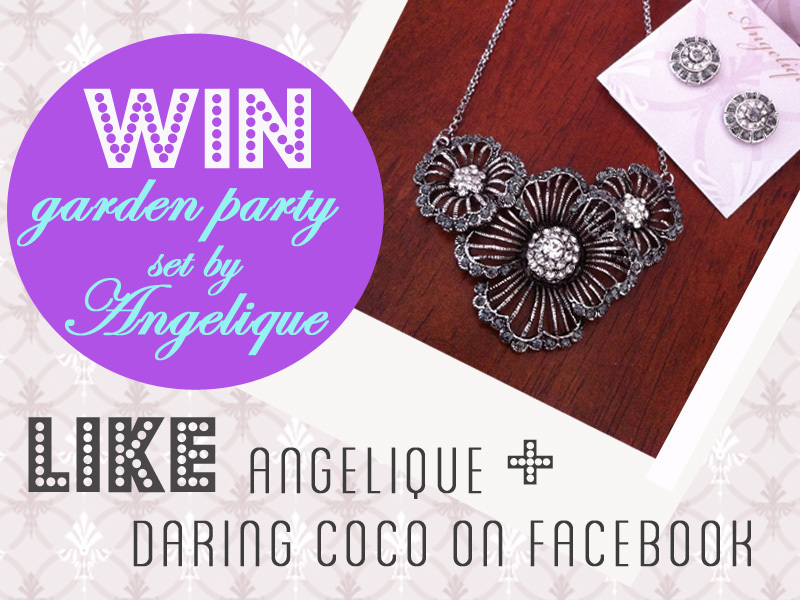 Angelique are kindly giving away their glamorous Garden Party necklace and earring set to one lucky follower. A truly decadent piece that transcends seasons, whether it be a sunny springtime or fabulous fall the vintage inspired floral piece is a statement in it’s own right, pair them up for an instant and effortless, old Hollywood glam to your ensemble. Enter below and make sure you like BOTH Angelique and Daring Coco for your entry to count! Please make sure you complete the 3 mandatory steps above by ‘liking’ Angelique and Daring Coco on Facebook and then leaving a comment on this post with your name and email details. Giveaway begins from Tuesday 4th of September and ends Tuesday 25th of September at 11:59pm. Please ensure you leave your contact details below so the lucky winner can be notified. This fabulous giveaway is open Internationally y’all so go ahead enter and spread the word!